Painting while traveling is a great way to be in the moment, to observe your environs and record them for history. Photographs can only take you so far! With a sketchbook and a small box of gouache paints, you’re ready to go! What is Gouache? Gouache is basically opaque watercolor, but it works differently than traditional watercolor. It’s perfect for opaque painters who want to travel with their paints but want a smaller size for quick sketches on the go. 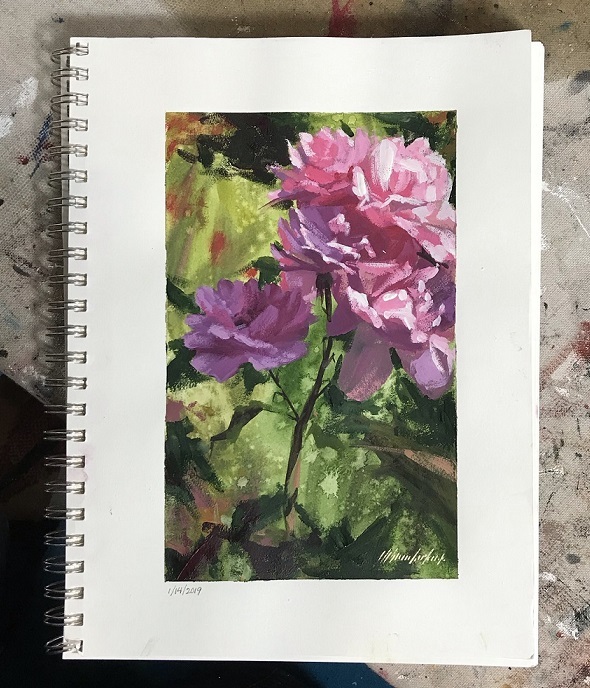 Angela will demonstrate her techniques for creating works of art in a sketchbook using this versatile medium, and how she travels with it when flying to far off destinations. GOUACHE PAINT: Angela prefers M. Graham Gouache because it has honey in the mixture and is highly pigmented for better color and coverage. Please avoid purchasing any brands that are Acryla-Gouache mixes as they are actually just matte acrylic paint, not true gouache. Also avoid any dried pan gouache, as this may not be true gouache either, and it will not allow you to use it the way Angela does. SKETCHBOOK: Bee Super Deluxe Sketchbook, 9x9 or 12x9 inch size (808 series) or equivalent. Must be able to accept liquid media and not have much texture. PALETTE: Disposable paper palettes, either 9x12 or a small 5x7 size if available. Palette must be flat with no little wells or indents. OR bring a small tupperware container to hold your paint tubes. A shallow container works well and if the lid is flat it can be used as a palette. (See photos for my example - this is a 1.25-cup SnapWare container, and has the benefit of being water tight but any small container with a flat lid will do! ).